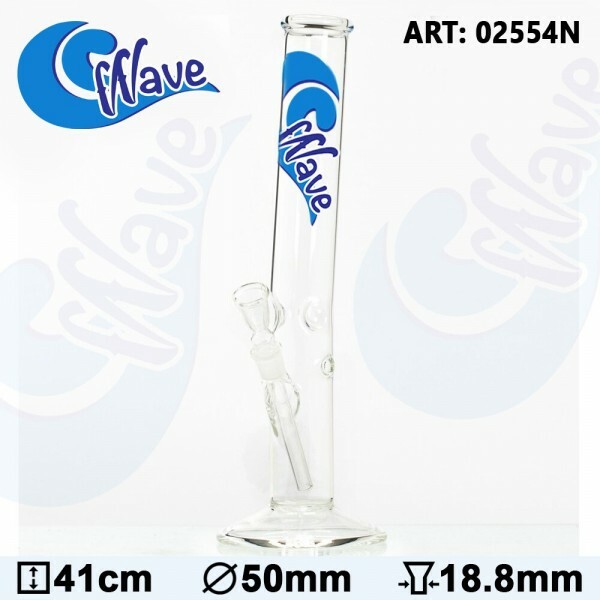 This Wave Glass Bong is a fine piece of glass art that can give you a lift! It is formed in the shape of a hollow base tube of 50mm diameter and 41cm height.You can place your favourite herbs or tobacco on the slide bowl, which connects to a detachable chillum through a sure ground of 18.8mm diameter. The chillum is used as a diffuser, for spreading your smoke into the tube, so that it gets filtered by the water. The bong includes also some ice noches that will hold a few cubes, for cooling your smoke, and a kick hole at the height of the socket that will offer you an alternative toke angle. With the Wave logo featuring at the top of the tube, the tube ends up in a slide mouthpiece ring through a curving neck that will offer you a more comfortable grip in addition to a funny sense of smoking.